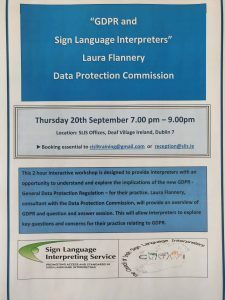 This 2 hour interactive workshop is designed to provide interpreters with an opportunity to understand and explore the implications of the new GDPR – General Data Protection Regulation – for their practice. Laura Flannery, consultant with the Data Protection Commission, will provide an overview of GDPR and question and answer session. This will allow interpreters to explore key questions and concerns for their practice relating to GDPR.